Peat is a dark, fibrous accumulation of partially decomposed and disintegrated organic matter found in wet areas, and usually comprising residues of plants such as mosses but also including sedges, trees, and other plant, and even animal, matter. It is generally light and spongy in consistency and dark brown or black in color. Peat forms in wetlands or peatlands, variously characterized as bogs, moors, muskegs, pocosins, mires, and peat swamp forests. It is typically formed in temperate, humid environments where the decomposition is slowed and the land is waterlogged. 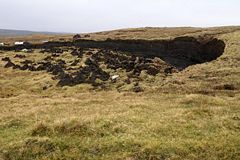 There are several different types of peat and peat-forming terrains, ranging from wetlands or marshes to uplands covered with low-growing vegetation. Moss peat is usually formed from Sphagnum moss and commonly called peat moss. Peat offers numerous values for people. It can be dried and burned as an energy source for home heating or even for power stations. Peat also is used as a soil conditioner and an additive that increases the soil's capacity to hold water. It is used as insulating material and for potting plants. In its natural setting, it can help in flood mitigation and peat wetlands are a major resource of unique species. Longer term, peat is a early transition stage in the formation of coal. Anaerobic acidic sphagnum bogs are known to preserve mammalian bodies extremely well for millennia. There is concern that commercial interests, or the desire to convert peatland to intensive residential and agricultural use, is causing a precipitous decline of this natural environment and resource, one that takes centuries to regenerate. Peat exploitation in East Frisia, Germany. Peat is found in many types of wetlands, including marshes, swamps, and coastal wetlands, but particularly large deposits (more than 300 to 400 millimeters in depth) are found in mires, which are complex ecosystems that include upland bogs and fens (Finlayson and Moser 1991). Bogs are formed when precipitation (rain and snow) feeds directly into an area with a high watertable and with soil that is acidic and depleted of nutrients due to leaching and is also covered with slowly decomposing organic material (Finlayson and Moser 1991). Fens are fed by ground water or by interior drainage into a low-lying area rather than by precipitation; they are higher in nutrients and lower in acidity, but can still produce peat (Finlayson and Moser 1991). Peat deposits are found in many places around the world, notably in Russia, Ireland, Finland, Estonia, Scotland, Poland, northern Germany, the Netherlands, Scandinavia, New Zealand, and in North America, principally in Canada, Michigan, Minnesota, the Florida Everglades, and California's Sacramento-San Joaquin River Delta. Approximately 60 percent of the world's wetlands are peat. Peatlands cover a total of around three percent of global land area (Joosten 2007) or 3,850,000 to 4,100,000 km². Peat contains an estimated 550 gigatons (1 gigaton = 1 billion metric tons) of carbon, which is equivalent to 30 percent of all global soil carbon and 75 percent of all atmospheric carbon, and twice the carbon stock of the world's forest biomass (Joosten 2007). Under proper conditions, peat will turn into lignite coal over geologic periods of time. Peat formation occurs in waterlogged land areas when decomposition fails to keep pace with production of organic matter; it involves such additional specific conditions as lack of oxygen or nutrients, lower temperatures, or high acidity (Finlayson and Moser 1991). Peat forms when plant material is inhibited from decaying fully by acidic and anaerobic conditions. This can occur both in low-lying marshy areas and in upland areas under certain conditions, such as have existed historically in much of the western parts of Ireland. Peat from marshy areas is composed mainly of marshland vegetation: Trees, grasses, fungi, as well as other types of organic remains, such as insects, and animal corpses. Under certain conditions, the decomposition of the latter (in the absence of oxygen) is inhibited, and archaeologists often take advantage of this. Under the right conditions, peat is the earliest stage in the formation of coal. Most modern peat bogs formed in high latitudes after the retreat of the glaciers at the end of the last ice age some 9,000 years ago. The highland bogs often formed as a direct result of deforestation by humans for agricultural purposes. Peat bogs usually grow slowly, at the rate of about a millimeter per year. Peat has been forming on earth for roughly 360 million years in places conducive to its formation, and it continues to form today, with some of the present-day peat changing into lignite, which will change in the future into coal (Joosten 2007). Peat material is classified as fibric, hemic, or sapric. Fibric peats are the least decomposed, and comprise intact fiber. Hemic peats are somewhat decomposed, and sapric are the most decomposed. Phragmites peat is one composed of the reed grass, Phragmites australis, and other grasses. It is denser than many other types of peat. Blanket mires: Rain-fed peatlands generally one to three meters deep. Many of the peatlands found in Ireland and the United Kingdom are of this type, with the UK alone possessing around 13 percent of the total global blanket mire area. They generally develop in cool climates with small seasonal temperature fluctuations and over one meter of rainfall and over 160 rain days each year. Blanket bogs covered over with low growing vegetation underlie large swaths of the upland areas of the British Isles. Raised mires: Rain-fed, potentially deep peatlands occurring principally in lowland areas across much of Northern Europe, as well as in the former USSR, North America, and parts of the southern hemisphere. String mires: Flat or concave peatlands with a string-like pattern of hummocks (hence the name), found principally in northern Scandinavia but occurring in the western parts of the former USSR and in North America. A few examples exist in northern Britain. A peat stack in Ness in the Isle of Lewis (Scotland). Worked bank in blanket bog, near Ulsta, Yell, Shetland Islands. Peat is soft and easily compressed. Under pressure, water in the peat is forced out. Upon drying, peat can be used as a fuel. It has industrial importance as a fuel in some countries, such as Ireland and Finland, where it is harvested on an industrial scale. In many countries, including Ireland and Scotland, where trees are often scarce, peat is traditionally used for cooking and domestic heating. Stacks of drying peat dug from the bogs can still be seen in some rural areas. Peat is also added into soil to increase the soil's capacity to retain moisture and add nutrients. This makes it important agriculturally, for farmers and gardeners. It also is used as an acidifying agent. Peat's insulating properties make it of use to industry. Peat fires are used to dry malted barley for use in Scotch whisky distillation. This gives Scotch whiskey its distinctive smoky flavor, often called "peatiness" by its aficionados. Although peat has many uses for humans, it also presents severe problems at times. When dry, it can be a major fire hazard, as peat fires can burn almost indefinitely (or at least until the fuel is exhausted), even underground, provided there is a source of oxygen. Peat deposits also pose major difficulties to builders of structures, roads, and railways, as they are highly compressible under even small loads. When the West Highland Line was built across Rannoch Moor in western Scotland, its builders had to float the tracks on a mattress of tree roots, brushwood, and thousands of tons of earth and ashes. During prehistoric times, peat bogs had considerable ritual significance to Bronze Age and Iron Age peoples, who considered them to be home to (or at least associated with) nature gods or spirits. The bodies of the victims of ritual sacrifices have been found in a number of locations in England, Ireland, and especially northern Germany and Denmark, almost perfectly preserved by the tanning properties of the acidic water. Peat wetlands formerly had a degree of metallurgical importance as well. During the Dark Ages, peat bogs were the primary source of bog iron, used to create the swords and armor of the Vikings. Many peat swamps along the coast of Malaysia serve as a natural means of flood mitigation. The peat swamps serve as a natural form of water catchment or "sponge" whereby any overflow will be absorbed by the peat. However, this is effective only if the forests are still present. Peat is also an important raw material in horticulture and for potting; it is used in medicine and balneology and for producing filters, textiles, more. Peat is sometimes used in freshwater aquaria, most commonly in soft water or blackwater river systems, such as those mimicking the Amazon River basin. In addition to being soft in texture and therefore suitable for demersal (bottom-dwelling) species such as Corydoras catfish, peat is reported to have a number of other beneficial functions in freshwater aquaria. It softens water by acting as an ion exchanger, it contains substances good for plants and for the reproductive health of fishes, and can even prevent algae growth and kill microorganisms. Peat often stains the water yellow or brown due to the leaching of tannins (Scheurmann 1985). Peat is also used in cosmetic treatments, because it contains humic acids, which can be absorbed through skin and boost metabolism. 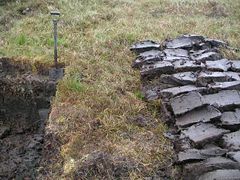 Some northern European acidic anaerobic peat bogs have proved to have the capability to preserve mammalian tissue for millennia, making them a valuable archaeological resource. Examples of this conservation are Tollund Man and Haraldskær Woman, both recovered from peat bogs with remarkable intact skin, internal organs and skeletons. Industrial milled peat production in a section of the Bog of Allen in the Irish Midlands. The turf in the foreground is machine produced for domestic use. In Ireland, large-scale domestic and industrial peat usage is widespread. 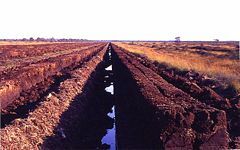 Specifically in the Republic of Ireland, a state-owned company called Bord na Móna is responsible for managing peat production. It produces milled peat that is used in power stations. It also sells processed peat fuel in the form of peat briquettes used for domestic heating; these are oblong bars of densely compressed, dried, and shredded peat. Briquettes are largely smokeless when burned in domestic fireplaces and as such are widely used in Irish towns and cities where burning non-smokeless coal is banned. Peat moss is a manufactured product for use in garden cultivation. Turf (dried out peat sods) is very commonly used in rural areas. Thanks to the climate, geography, and environment of Finland, bogs and peat bogs (turvesuo in Finnish) are widespread. Twenty-six percent of the land area of Finland is bog of some sort. Because of this abundance of sources, peat is available in considerable quantities: Some estimates put the amount of peat in Finland alone to be twice the size of North Sea oil reserves (Vapo). This abundant resource (often mixed with wood at an average of 2.6 percent) is burned in order to produce heat and electricity. Peat provides approximately 6.2 percent of Finland's annual energy production, second only to Ireland. The state-owned company VAPO is the world leader in peat production with 21.7 million cubic meters in 2003 (Vapo). Finland classifies peat as a slowly renewing biomass fuel as opposed to the stance of the European Union and Intergovernmental Panel on Climate Change, which classify peat strictly as a fossil fuel. Peat producers in Finland often claim that peat is a special form of biofuel, because of the relatively fast retake rate of released CO2 if the bog is not forested for the following 100 years. Also, agricultural and forestry-drained peat bogs actively release more CO2 annually than is released in peat energy production in Finland (approx 30 TWh versus 25 TWh). The average regrowth rate of a single peat bog, however, is indeed slow, from 1,000 up to 5,000 years. Furthermore it is a common practice to forest used peat bogs instead of giving them a chance to renew, leading to lower levels of CO2 storage than the original peat bog. The contribution of peat to greenhouse gas emissions of Finland can exceed a yearly amount of ten million metric tons carbon dioxide, equal to the total emissions of all passenger car traffic in Finland. At 106 g CO2/MJ, the carbon dioxide emissions of peat are higher than those of coal (at 94.6 g CO2/MJ) and natural gas (at 56.1) (IPCC). Peat extraction is also seen by some conservationists as the main threat to mire biodiversity in Finland. The International Mire Conservation Group (IMCG), in 2006, urged the local and national governments of Finland to protect and conserve the remaining pristine peatland ecosystems. This includes the cessation of drainage and peat extraction in intact mire sites and the abandoning of current and planned groundwater extraction that may affect these sites. Because of the unique and challenging ecological conditions of peat wetlands, they are home to many rare and specialized organisms that are found nowhere else. Some environmental organizations and scientists have pointed out that the large-scale removal of peat from bogs in Britain, Ireland, and Finland is destroying wildlife habitats. Peat has a high carbon content and can burn under low moisture conditions. Once ignited by the presence of a heat source (for example, a wildfire penetrating the subsurface), it smolders. These smoldering fires can burn undetected for very long periods of time (months, years, and even centuries) propagating in a creeping fashion through the underground peat layer. Peat fires are emerging as a global threat with significant economic, social, and ecological impacts. Recent burning of peat bogs in Indonesia, with their large and deep growths containing more than 50 billion tons of carbon, has contributed to increases in world carbon dioxide levels. Peat deposits in southeast Asia could be destroyed by 2040 (Rincon 2005; Levine et al. 1999). In 1997, it is estimated that peat and forest fires in Indonesia released between 0.81 and 2.57 Gt of carbon; equivalent to 13-40 percent of the amount released by global fossil fuel burning, and greater than the carbon uptake of the world's biosphere. 1997 was unusually high, however. These fires likely are responsible for the boost in the increase in carbon dioxide levels since being noticed in 1997 (Lazaroff 2002; Pearce 2004). Finlayson, M., and M. Moser. 1991. What is peat? International Waterfowl and Wetlands Research Bureau (IWRB). Reprinted in Wetlands Australia 6: 7. Retrieved May 4, 2008. Joosten, H. 2007. Peat should not be treated as a renewable energy source. International Mire Conservation Group. Retrieved May 4, 2008. Lazaroff, C. 2002. 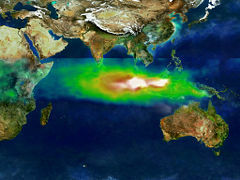 Indonesian wildfires accelerated global warming. Environmental News Service November 8, 2002. Retrieved May 4, 2008. Levine, J. S., T. Bobbe, N. Ray, R. G. Witt, and A. Singh. 1999. Wildland fires and the environment: A global synthesis. UNEP, Division of Environmental Information, Assessment & Early Warning/North America. Retrieved May 4, 2008. Pearce, F. 2004. Massive peat burn is speeding climate change. New Scientist November 6, 2004. Retrieved May 4, 2008. Rincon, P. 2005. Asian peat fires add to warming. BBC September 3, 2005. Retrieved May 4, 2008. Scheurmann, I. 2000. The Natural Aquarium Handbook. Hauppauge, NY: Barron's. ISBN 0764114409. Vapo. n.d. Peat is a significant natural resource. Vapo. Retrieved May 4, 2008. This page was last modified on 31 January 2019, at 17:51.